Mark Burgess with a brace of typical salmon from Lake Coleridge. They were taken on spinning gear at the Harper River mouth. This article is aimed at helping the complete beginner angler who wants to travel to Lake Coleridge for High Country Opening weekend, and hopefully catch a trout or salmon, but has absolutely no idea where to start. Here are my Lake Coleridge Fishing Tips. Here is a list of step by step Lake Coleridge fishing tips that you can follow. If you follow this plan there is a very good chance you will have Opening Weekend success! A picket fence line of anglers fishing at Ryton Bay. From this position, spin anglers gain the advantage of a tailwind when casting! For those who are un-initiated High Country, Opening Weekend is something of a tradition among Canterbury anglers. 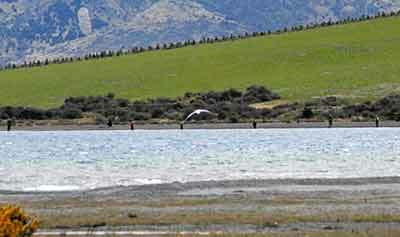 On the first Saturday in November hundreds of mad keen anglers travel from all over the place to Lake Coleridge for a weekend of camping and fishing. Some have not missed the Opening of Coleridge in over half a century! It is a chance to meet up with old mates and do a bit of fishing in a picturesque alpine setting. It is tremendous fun and once experienced you too could be hooked! Firstly we are going to be spin fishing. Spinning is easier for the complete novice than fly fishing and is better suited to fishing in deep lakes like Coleridge. You will find that the majority of anglers fishing around the shoreline of Lake Coleridge will also be spin fishing. We are not going to be casting anything heavier than 20 grams at most. However when fishing this type of large high country water most anglers fish with what could best be described as lightweight salmon gear that would otherwise be used for river fishing. In other words, heavier gear than you might use if spin fishing for trout in smaller streams. The reason for this is because we want to make long casts with ticers weighing up to about 17 or 20 grammes. We also want to be able to fish into a strong head-wind if need be. The slightly heavier ticers are also needed to get down deep where the salmon are schooling. What you need is a spinning rod designed to cast weights between about 10 and 40 grammes. It is best to select a rod at least 2 metres (7 feet) in length as it will be better for distance casting. Don’t let the bloke in the shop talk you into anything shorter or lighter. Keep in mind you will be fishing a big deep lake. Fishing at the mouth of the Harper River, Lake Coleridge. Next, you’ll need a fixed spool spinning reel – also called an eggbeater. Get something like a Shimano Aerocast 4010, or the equivalent in size. Spool it up with 6 lb monofilament. A reel this size will hold several hundred metres of 6 lb (2.7 kg) mono. This set-up will allow you to cast a good long distance even into a head-wind. The light monofilament will help your lure to sink quickly. Many anglers nowadays fish with braided line on the lakes instead of monofilament. Braid has almost no stretch so you will be able to feel your lure touching the bottom and most importantly you will be able to feel the slightest touch from a fish. It also casts further. If you decide to fish with a braided line you will need to add a leader of monofilament or fluorocarbon to the end of the braided line as fish don’t like the braid! The leader needs to be about two-rod lengths and joined with a special knot that won’t slip. Most anglers use a double uni-knot. But there are other knots you can use. You might find filling your spool with 6 lb monofilament to be the cheaper and simpler option. It’s up to you. A 17-gram silver ticer with red tag is an excellent lure when spinning for salmon from shore at Lake Coleridge. I know it seems heavy for lake fishing but when the wind is howling this lure will punch into it. The ticer will also sink quickly to where the salmon are schooling. Lures for fishing Lake Coleridge As we are going to be fishing in Lake Coleridge I suggest you spin with ticers. These are cut from a hexagonal brass rod and then painted or silvered. The weight to use as mentioned above is 17 or 20g. The salmon are most likely to take them in silver. I suggest you get the ticers with the small red plastic tag. Refer to the picture for the right ticers to buy. These will sink down quickly to where the fish are. When your lure gets close to shore wind faster to prevent it from getting stuck behind a rock. The extent to which this likely depends on whereabouts around the lake you are fishing. Avoid having to cast over shallow water if you can thereby avoiding these sorts of losses. Launching near Boat Harbour, at the head of Lake Coleridge. Although many anglers fish from boats on Opening Weekend, there would be many more spin fishing from shore. The wind can fair howl down the lake. Boaties should be prepared to fish from shore as sometimes the lake conditions are too dangerous for boating. I would get about 6 of these silver ticers. You may lose none of them but it pays to have some spares just in case you do. Lets quickly take a look at what you don’t need. You don’t really need a net when fishing around Lake Coleridge because the shoreline is generally shallow and rises up a gentle slope. So you can just slide your fish along the stones. Trout and landlocked salmon ticers. Also called hex wobblers, slices and wedges. Smaller ones weighing about 6 to 18g are ideal for lake fishing because they cast easily and sink quickly. The darker colours are used in murky water and at night. You don’t really need waders either. Neoprene waders are nice to have especially when it is very cold. But you can spin fish around Lake Coleridge without getting your feet wet. Some anglers like to wade out into the water – in particular when fishing river mouths. A pair of gumboots will be good enough. What you certainly do need is plenty of warm clothing. If you don’t have waders wear two pairs of pants. Wear plenty of layers over your upper body as it sure can get cold at Lake Coleridge for Opening Day! Finally, don’t forget a woolly hat or beanie. A balaclava is even better when it’s really cold. You lose a lot of heat from your face and ears. If you can stretch to a pair of neoprene fishing gloves you disguise will be complete. As the day warms up you can always take a few layers off. This is way better than trying to fish while shivering and shaking from the cold. Fish & Game regularly release Quinnat salmon into Lake Coleridge as salmon do not breed in the lake. Here a ranger weighs one of the many salmon caught on Opening Day 2012, Ryton Bay. Photograph Allan Burgess. View from Ryton Bay looking back up the valley as contestants gather before the prizegiving gets underway. Saturday 7 November 2009. I suggest that your best spot for spin fishing on Opening Day is the mouth of the Harper River. This will be your best chance of hooking a fish! Most likely a salmon. The salmon school in Lake Coleridge. So if you just keep casting out from the river-mouth sooner or later a school of fish are going to come in range. A constant supply of food items are washed into the lake so the fish will be waiting beyond the drop-off. Two combined Lake Coleridge Opening Day limit bags of land-locked salmon. The Harper River mouth fans out for several hundred metres so there will be plenty of space for you to fish. Don’t worry if you aren’t right in the middle of the main flow. It won’t matter. Remember those salmon will be schooling so they are going to come within range of your lure sooner or later. Its just a case of being ready when they do by having your lure in the water. Fishing club’s marque at the Harper River Diversion, Lake Coleridge Opening Day 2012. Tip 1. Get up early. You are allowed to start fishing at 5.00am. I know that’s very early – too early for some! It means you have to wake-up around 4.30 – 4.45am. Get a hot drink down and head to your fishing spot that you will have reconnoitred the day before. This all implies a certain degree of organisation on your part including getting to the lake early and retiring for the night so you will be fresh in the morning. I suggest you try out the new TrustPower Freedom Camping Area which is about a kilometre back up the road next to the Harper River Diversion. The reason for the early start is so that you can be fishing for the first couple of hours before the sun hits the water. This is the best time to fish. It is when most of the fish will be caught. This is the time when the “experts” will catch their limit and be back at camp before 8.00am. Seriously! A Fish & Game ranger weighs a contestant’s salmon for the annual Lake Coleridge fishing competition.